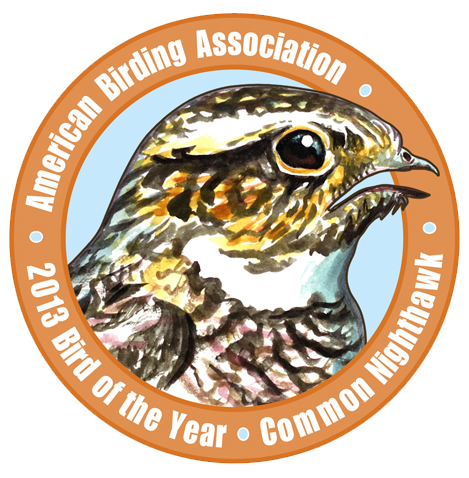 I set out a year ago to write 50 “blog” entries about the Common Nighthawk, the ABA’s 2013 Bird of the Year — and an inspired choice. The 2014 bird is just as exciting, I understand. I don’t know about you — how possibly could I? — but I learned an awful lot about this common and familiar species this year, and I think, without having the time or the vanity to count, that I may have come close to my target in writing about the bird. 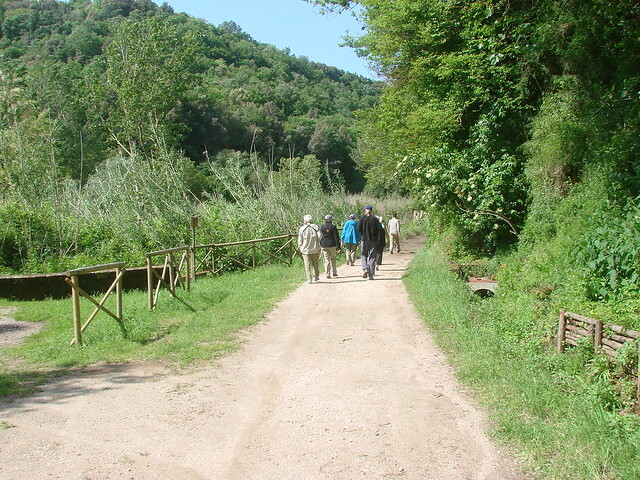 I do know that I was extraordinarily grateful to get to speak to so many interested and interesting birding groups about the bird, its history, and its prospects, and there are still a few nighthawk lectures on my calendar for the New Year, so hope to see the rest of you out there, too. One thing that I learned is that nighthawks, and probably most birds, can appear at times and in places that are utterly, entirely unexpected. 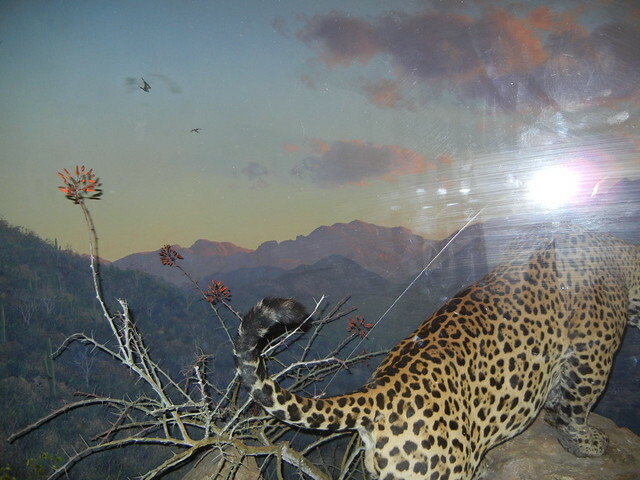 One of my favorite habitat groups at the American Museum is the jaguars, an emphatically male mount and a large kitten perched on the rocks of a Sonoran mountainside at sunset. 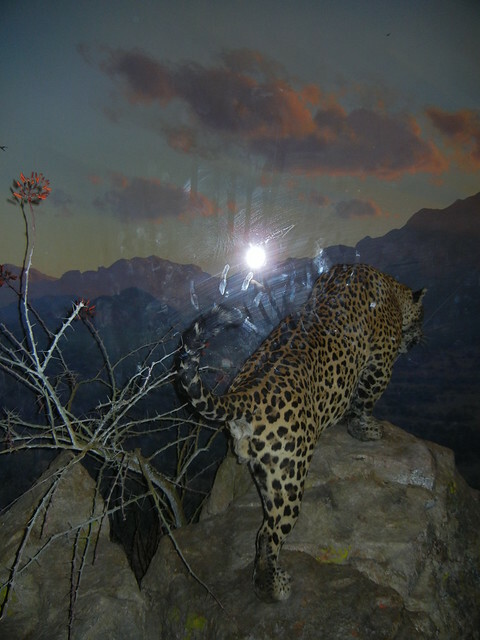 I’ve never seen that animal, alas, but I love Sonora and I love the thought of jaguars, and Alison and I always pause, in reverence and reverie, at this case when we walk through the mammals. We’re not alone: there’s always a small crowd enthralled by these charismatic kitties. 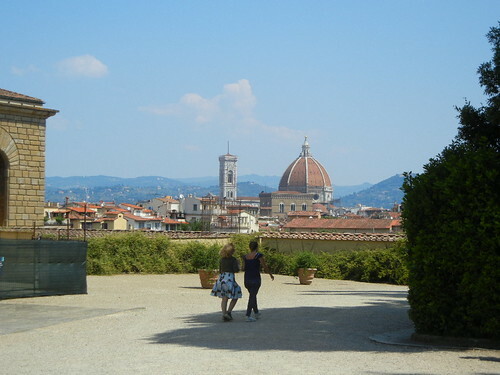 But how many notice the birds in the skies above them? Common Nighthawks aren’t, in my experience, hugely common in northwest Mexico, but they do occur, and their presence in this group adds to its wondrousness. I can feel the last warmth of the day, the cool air rushing down the canyon below, and the atavistic excitement of being in the presence of one of the few American mammals that can lord it over us humans. And I hear the buzzes and whooshes of the nighthawks high overhead. Let’s hope on this eve of a new year that jaguars and nighthawks and all of the other miracles of the Sierra Madre persist for the human generations to come, sending chills down the spines of our descendants in their different ways. Photographs of mounted birds are grotesque enough, but it gets downright uncanny when they talk. This is much scarier than any “doleful notes” the living bird might utter. Christmas of 1897 found a new and exciting book under many a young birder’s tree. 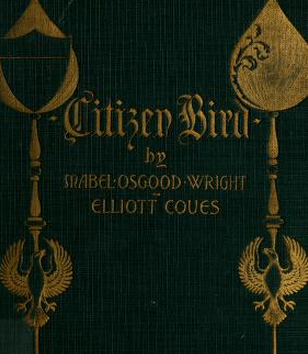 Citizen Bird was the latest offering from Mabel Osgood Wright, one of the turn of that century’s most important authors of bird books for children and novices. Written, as its subtitle promises, “in plain English for beginners,” Citizen Bird was a collaboration between Wright, Elliott Coues, and Louis Agassiz Fuertes — a high-powered team if ever there was one. The book’s conceit is simple and straightforward: the Doctor, obviously Coues’s fictional alter-ego, takes his young daughter and her two cousins, along with the neighbor boy Rap, on a series of pastoral walks and leisurely carriage rides across Orchard Farm, where they encounter the wild birds and fall into conversation with Mammy Bun, a retired nurse, and Olaf, a fisherman. a large bird that had been sailing about overhead dropped through the air till it was almost over the surrey, then turned suddenly and darted upward again…. 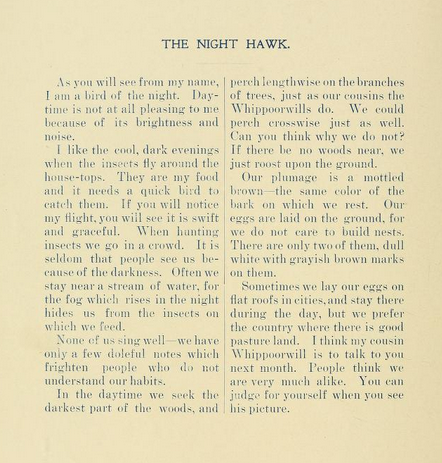 “That’s a Nighthawk … he’s looking for small birds to eat,” [said] Rap. I can’t recall ever having seen a Common Nighthawk tussling with even the largest insect on the ground, but apparently it happens, and not just at Orchard Farm. Those of us in the east and midwest really have only one Chordeiles to worry about most of the time, the Common Nighthawk. 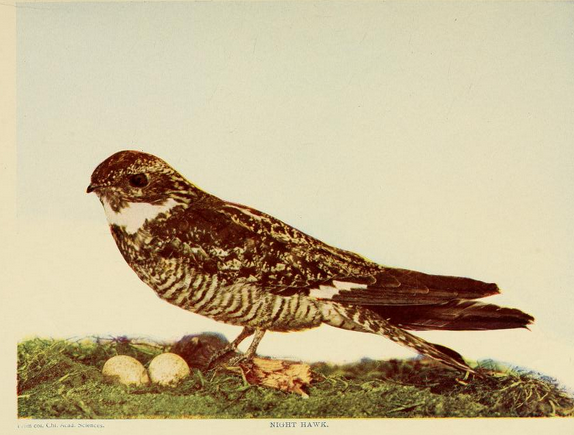 In the deserts of the southwest, however, a second species, the Lesser Nighthawk, flies into the identification ointment. Everybody knows the subtle plumage distinctions (though beware Henry’s Nighthawk!) 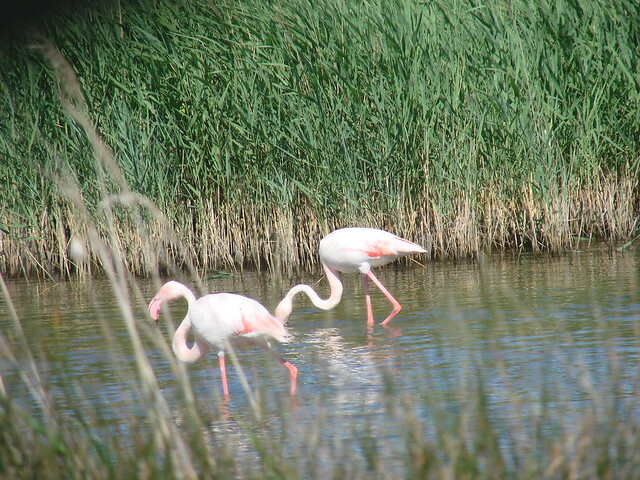 and the differences in wing shape and vocalizations — but this time of year there’s another trick. 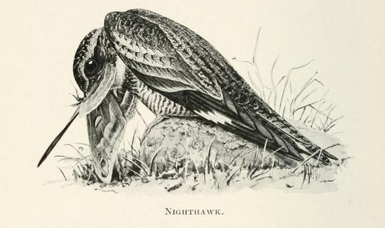 Common Nighthawks molt their flight feathers on the wintering grounds, far south of the US. 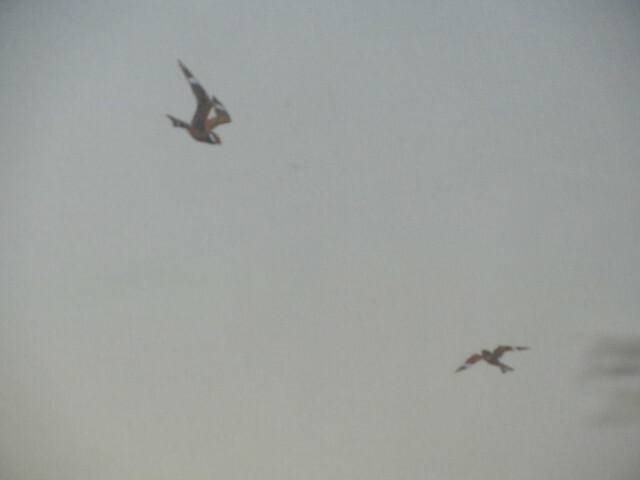 Adult Lessers, in contrast, are shedding primaries this month, resulting in strange (but symmetrical) gaps and patches in the outer wing, as shown by the blurry bird in the photo. Neat, huh?